The detailed application for Phase 1 for Felnex is now out for public consultation. Details for this can be viewed on Sutton Council’s website using Planning application number: C2014/68755. Responses should be sent back by 30 May 2014. The original outline application which was agreed by Sutton Council can be found using Planning Application number: C2009/62175. The overview proposal for Phase 1 is to provide a supermarket with car parking (hidden from view) and residential accommodation. Have a look at the main Felnex page for further information. www.sutton.gov.uk/planningapplicationsearch and put in the relevant 5 digit number only i.e. 68755 and hit return. Sometimes it comes back saying nothing found. Hit return again and it then usually works! Previous Does Hackbridge need another takeaway? good to see the actual docs – I notice that elevation does not show the buildings relevant to Centrale (oops sorry – Saxon House!) – are they higher? 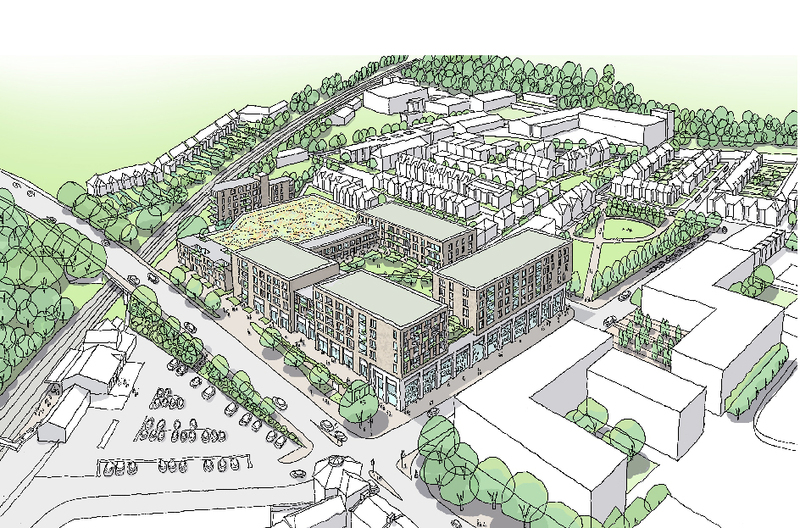 If you look at pages 26 and 27 of the Design and Access statement – this is the first document that is labelled ‘supporting information’ from the Sutton Council Website link, it will show you the elevation along London Road in context to Centrale (Saxon House). To answer your question, yes, some of it is higher.